Like many businesses, your company may utilize autos owned by someone else, such as an employee, partner, or rental agency. Even though you don't own them, such vehicles should be insured under your commercial auto liability coverage. This will ensure you are protected if any of those vehicles is involved in an accident that results in a lawsuit against your firm. Vehicles your company rents, leases, hires or borrows are called hired autos under the standard business auto policy. 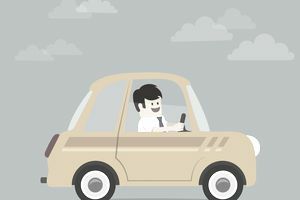 A hired auto is a vehicle you rent or lease on a short-term basis, such as a car you rent for a three-day business trip. Autos you lease long-term (for six months or more) are insured in the same manner as autos you own. Don't Rely on the Owner's Coverage! It is generally a bad idea to rely on someone else's insurance as your sole source of protection against auto liability claims. Consequently, you should not depend on a rental agency's liability insurance to safeguard your business against lawsuits arising out of vehicles you rent. Some states don't require rental companies to provide any auto liability coverage to their customers. States that do demand coverage generally require only the minimum limit mandated by law. This limit is usually very low. To protect your business against lawsuits, you need to purchase hired auto liability coverage. Similarly, you should not rely on a vehicle owner's insurance to protect your business from claims arising from the use of non-owned autos. For one thing, the vehicle owner could be uninsured or have minimal coverage. Even if you verify that the vehicle is adequately insured, the owner might cancel the policy. Moreover, the owner's insurance might not cover drivers other than the owner. For these reasons, your commercial auto policy should include non-owned auto liability coverage. Hired and non-owned auto liability coverages are a wise investment since auto liability claims can be very costly. An accident that causes serious injuries to another driver or a pedestrian can result in damages against your firm of $100,000 or more. If you do not have the proper liability insurance, a single claim could put your company out of business. Note that hired and non-owned auto liability coverages apply on an excess basis. That is, these coverages apply after other collectible primary insurance, such as the vehicle owner's auto policy, has been used up. Hired auto and non-owned auto liability coverages are available under a commercial auto policy. They can be purchased alone or in conjunction with insurance covering vehicles your company owns. If you do not have a commercial auto policy, your liability insurer may be willing to add hired and non-owned auto coverages to your general liability policy. These coverages may be included in a liability policy via an endorsement. Suppose you already have a commercial auto policy but aren't sure whether it covers hired and non-owned autos. You can make this determination by looking at the covered auto designation symbols in the declarations. If symbol 1 (any auto) or symbols 8 and 9 (hired and non-owned autos, respectively) appear next to liability coverage, hired and non-owned autos are covered. The premium for hired auto liability coverage is based on the cost of hire, meaning the money you spend renting vehicles. Your insurer may charge you a small minimum premium when your coverage begins. After your policy has expired, your insurer will ask for a tally of your rental costs during the policy period. The insurer will calculate your premium. If your actual premium exceeds the sum you paid initially, your insurer may bill you for the additional amount. The premium for non-owned auto coverage is based on the number of workers you employ. The insurer calculates an average number of employees for the year and applies a rate.